Why Has Tom Cruise's Reputation Faltered? Pshh, Because Of The Internet, Of Course! We gather here today to mourn the passing of one Tom Cruise, gentleman and movie star undone by, you guessed it, the damned internet. As this, ahem, article by Amy Nicholson notes, Tom Cruise has been "destroyed" by YouTube and internet journalism. He was also, apparently, our "last movie star." Oh, and he never jumped on Oprah's couch, either. Confused? Get ready, because this is going to be a strange, strange ride. Nicholson, writing for the L.A. Weekly News, starts off her expose on how the internet killed Tom Cruise by sending us down memory lane. You can probably picture it in your head: Tom Cruise, dressed in head-to-toe black, looming over a cowering Oprah as he jumps up and down on the buttermilk-colored couch like a toddler throwing a tantrum. Cruise bouncing on that couch is one of the touchstones of the last decade, the punchline every time someone writes about his career. There's just one catch: It never happened. It's a breathtaking discovery to find out that this is all apparently some kind of CGI mega-conspiracy to dethrone a man who is still quite alive and very much still making big budget movies. That video, which shows Tom Cruise jumping on Orpah's freaking couch, never actually happened apparently. The mind reels knowing that, as Nicholson states, just like "Humphrey Bogart saying, "Play it again, Sam," Tom Cruise jumping on a couch is one of our mass hallucinations." That video, according to her, single-video-edly destroyed Tom Cruise's still-ongoing-career. Honestly, I don't even know where to begin with an article that starts off with two so clearly incorrect premises. Nicholson's idea for continuing the article consists of two pages about how awesome Tom Cruise is that would be better described as adoration than prose. The only mildly interesting bit in the whole section consists of how well his publicist at the time, Pat Kingsley, controlled the press. She was adamant about keeping Cruise out of the tabloids. At press junkets, she demanded that journalists sign contracts swearing not to sell their quotes to the supermarket rags. Then Kingsley expanded her reach and insisted that all TV interviewers destroy their tapes after his segment had aired. Reporters were exasperated, but there wasn't much they could do about it. Kingsley had a slew of other big talents (Meg Ryan, Sandra Bullock, Al Pacino) on her roster. Thanks to media consolidation, she was able to keep the media on track by making only a few phone calls threatening to cut off access. Well, she sounds like a real snuggle bear, that one, but Nicholson's point is made later when she describes the villain in this story: the internet. Oh, and us, too. We're totally to blame for Tom Cruise's reputation taking a turn. With gossip sites mushrooming like a nuclear cloud, Kingsley's fear tactics no longer worked — in fact, she wasn't even around to wield them. She'd spent a decade and a half shielding Cruise from questions about his religion. But as Scientology increasingly drew fire from the media, Cruise seemed to have decided to be more vocal about defending his beliefs. When he sought to promote Scientology on his press tour for The Last Samurai in 2003, Kingsley later told The Hollywood Reporter, she told him to cool it...When their faster, meaner formula worked, the old guard was forced to follow suit. In May, People's blog, then a half-hearted affair, ran seven stories about Tom Cruise. In June, it ran 25. In other words, the explosion of internet blogging nixed the need for access to celebrities, because the audiences didn't really want to hear interviews, they just wanted gossip. Nicholson argues that the timing for this explosion coincided almost perfectly with the timing of Cruise's Oprah appearance in which he did, but didn't, jump on a couch. She argues that if we had all seen the entire interview instead of simply watching YouTube clips, we would have understood not only that Cruise never jumped on a couch, but that his behavior was perfectly in line with the atmosphere of the show, because there were screaming women everywhere. One wonders how the Beatles managed not to jump on all the things every time they got off a plane, but I digress. I have watched the entire interview and Cruise isn't saved by context (Link to Part 2 of the YouTube series, and one jump happens about 45 seconds in, but you can find all parts there to watch the entire thing). Things only got worse when people decided that having a sense of humor was kind of fun. A week later, [Andy] Baio hosted another funny video he found on a private sharing site, a short mash-up of Star Wars: Episode III: Revenge of the Sith and Cruise's appearance on Oprah, two pop culture jokes from that May. Dubbed "Tom Cruise Kills Oprah," the movie star cackles in slow-motion as he blasts the talk-show host with a jolt of Jedi lightning. Baio thought the video was "awesome." He put it online and, just as "Star Wars Kid" had before, it blew up. This time, however, it wasn't just the geeks linking to his video — it was MSNBC and USA Today. Parodying famous people? Oh, what new horrors the cruel internet always seems to bring. Never mind that this kind of thing was done for fun and profit since around forever, this is on the internet, so it's totally way worse. When Saturday Night Live did it all those years ago it was fine, but now the simple creatures of the citizenry think they can have fun? At the expense of our Lord Tom Cruise, whose name we exhault and upon whom we heap our praise? Please. And remember, that couch jumping thing never happened. Cruise was just, you know, er, standing on the couch. Seriously. The distinction between standing and jumping is small but significant. We imagine Cruise bouncing on the couch — we can even picture it — because the Internet convinced us it happened. The echoing blogosphere screaming "Kills!" and "Jumps!" rewrote over what little of the actual episode people saw. Except the he did jump on that damned couch, I've seen the video of it, you can't deny it, and oh my god why are we freaking talking about this? What Nicholson hints at, but never allows her article to realize, is that the Oprah appearance and the internet's reaction to it have played such a tiny role in the downturn of Tom Cruise's reputation that I don't even really know how she got to focusing on it. If we're going to be blunt, Tom Cruise's reputation fell when he told the world about Scientology and people became interested enough in it to find out how absolutely horrifying it is, when he told the public that they shouldn't take prescribed antidepressant's and that you could combat suicide with his most odd of religions, and when he appeared strange and manic on a whole series of appearances, rather than just Oprah's. Hell, the Oprah interview isn't even his strangest. I'd argue this one, extolling the virtues of Scientology did far more harm to his reputation than any other single thing out there. But my larger question is why are we so busy defending Tom Cruise and demonizing the internet. And why are we saying stuff that happened didn't? That's just weird. There's been a big push by politicians across the country (and around the globe, as well) to enact laws that ban the use of cell phones while driving. While using your phone while driving isn't a great idea, neither are these laws. They attack a very narrowly defined distraction, which is really just a small part of a bigger problem: overall unsafe driving. There are many other activities that are dangerous distractions to a driver, but going after each of them, one by one, is inefficient, when the real focus should be on making people more safe drivers in general. It also doesn't really help that these laws may not be effective in making roads any safer, and that their real focus is revenue generation, not public safety. Now, Oprah has jumped into the fray, devoting an entire episode of her show to the issue, and pushing viewers to sign a No Phone Zone pledge that says they won't drive while yakking or texting. So far, she's collected more than 300,000 pledges, and while they certainly aren't a guarantee that people will stop using their phones while they drive, that figure does illustrate Oprah's broad reach and her ability to shine some light on issues. Building awareness through educational campaigns like this, that have the goal of actually changing behavior, may be much more effective in actually making the roads safer than narrowly targeted laws that punish behavior after the fact. 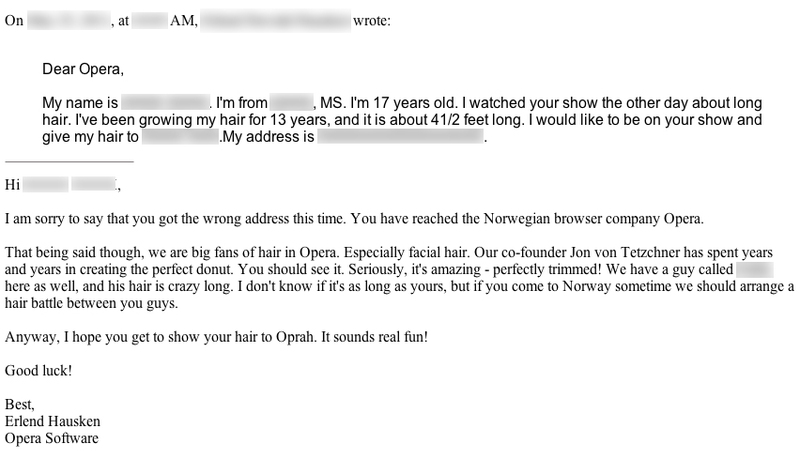 Reader Trails writes in with news of the latest ridiculousness from the world of trademark law, where Oprah Winfrey's Harpo Productions and insurance giant Mutual of Omaha got into a bit of a spat over the term "aha moment," with both companies claiming rights over the phrase. Apparently Winfrey regularly uses the phrase "an aha moment" on her television program. Mutual of Omaha came up with a marketing campaign around "official sponsor of the aha moment" and attempted to trademark the phrase. Oprah/Harpo didn't object to the original trademark application, though they later found out about it and legal proceedings began. While none of the press reports seem to point this out, it appears that Oprah had not trademarked the phrase herself, though, she did finally apply for the trademark on "aha moment" in June of this year (nearly a year after Mutual of Omaha's application. The two sides have now "settled," but this conceivably means that anyone else who uses the phrase in areas that potentially compete with Oprah or Mutual of Omaha might find themselves in trouble as well. Of course, it's also worth noting that a graphics company in Florida appears to have filed for a trademark on "Aha moment" when used on clothing well before either Oprah or Mutual of Omaha. Either way, this should be yet another "aha moment" of how companies are using things like trademark law to tie up and limit language, which is not (at all) it's original intended purpose. Did Amazon Cash In Big On Oprah Viewers' Confusion? theodp writes "In mid-December, the NY Post credited an endorsement from Oprah on her 'Favorite Things' show for making Planet Earth the best-selling DVD set on Amazon. And Amazon just reported that the $54.99 boxed set was one of its three best-selling DVDs this holiday season in terms of units sold. It'd be ironic if the huge sales numbers can be attributed to The Oprah Effect, since the David Attenborough-narrated version of Planet Earth sold by Amazon certainly wasn't the same as the Sigourney Weaver-narrated version sold by the Discovery Channel Store that was actually on Oprah's List. 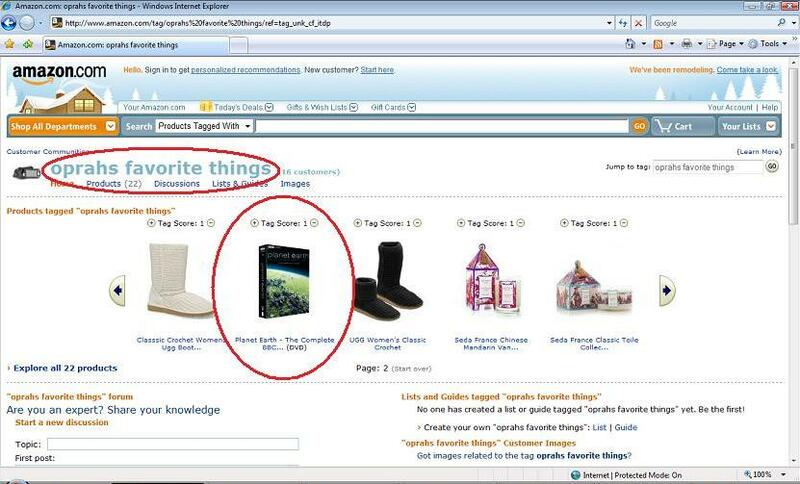 That the Amazon version wasn't just-what-the-Oprah-ordered wasn't evident from the Amazon web site, although some customers tried to warn potential buyers. Wasn't Amazon CEO Jeff Bezos all about warning customers that they're getting the wrong video, even at the expense of sales? Will breaking the don't-mess-with-Oprah rule come back to haunt Amazon in the form of refund requests?"